This plug-in was inspired by Matt Kloskowski's "All about presets" video on Youtube. In his video he asked the question "How do I know what's inside in a preset". That's when this preset was born. The "Preset Viewer" simple shows all the settings of a preset, in readable form and in your language. No cryptic codes and technical stuff. You ask: why would I want to see the preset settings? all settings in a preset overwrite current develop settings of an image. See example of the Aged photos preset below. 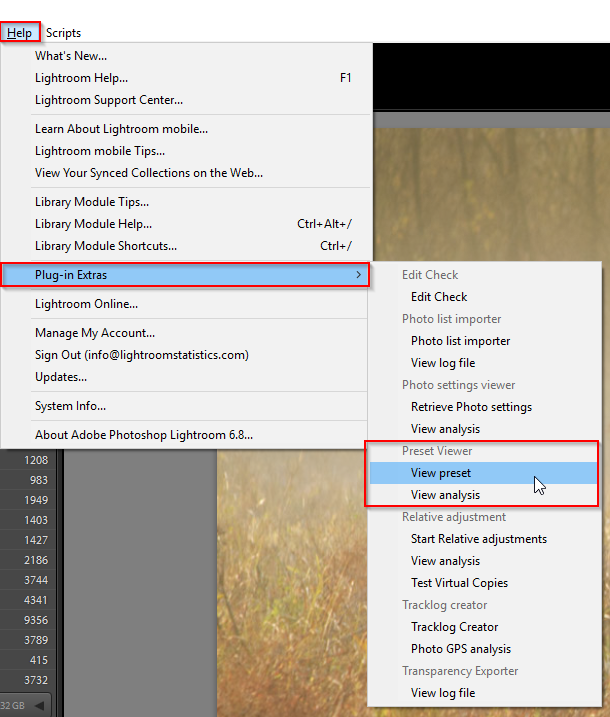 the preset "lrtemplate" files contain Lightroom internal codes which are difficult to understand. The standard Lightroom color presets -> Aged photos contains 86 settings. It overwrites for example all the Basic, Tone curve, HSL, Detail and Camera calibration settings. Yet only 16 settings have been altered and have not their default value. So if you already did some develop work before applying this preset, all that work is overwritten by the preset settings and this is bad in all cases where the preset only contains the default settings. So if you prior applied sharpening, all these settings would be reset to their default values. "Preset Viewer" plug-in - What problem is solved? Demo of the "Preset Viewer"
Although presets can greatly enhance your productivity and creativity, applying presets can also be dangerous. All settings in a preset will be applied to an image, potentially overwriting previous develop work. With this "Preset Viewer" you can easily explore the contents of one, several or all presets. The Big Question: How Do You Know What the Preset Did? This is actually easy to figure out. Just apply a preset to an image that has no other adjustments made to it and then take a look at the sliders. This should work, right? But is this really that easy? You have to open and check all panels to figure out which sliders have been changed. Time consuming! And what about sliders that have not zero as default? Ok, you can also look at the "lrtemplate" file, but this contains codes which are difficult to understand. This is where this little plug-in shines. Instead of searching all panels, this the plug-in simply creates a report of all settings in readable form in your language. You can choose a single preset, all presets from a folder or even all presets in all folders. By default the result is shown in your default browser (Firefox, Safari, Edge, Internet Explorer or Chrome). Easy to see which settings are contained in a preset. Can export single preset, but also all presets from a folder and even all presets in your catalog. Report can be opened in Word and Excel. Download the trial version and experience for yourself! This version has all the functionality but shows one preset per run. The "Preset Viewer" reads all the settings of a preset and translates them into a report with the proper descriptions in the language of Lightroom. This report automatically opens in your default browser (Firefox, Safari, Edge, Internet Explorer, Chrome, ...) but can also be opened in Excel or Word. In the sample report the Lightroom color presets are shown. Scroll through the table or use the search box. With these select lists you choose which preset(s) to show. Just open the lists and choose the preset, or all. When "on" the full width of your screen / browser will be used, when "off" the width is set to 1024 pixels. When selecting this option each table will have the height of the next setting. Advantage is that if there are many tables, the report will not be so long and it is easier to navigate. Of course all the information is there. If the table is bigger than the specified height, a scroll bar appears and you can scroll through it. When off the scroll bar disappears and all rows are shown. If you selected the option "Scrollable tables", this option determines the height of a table. Play around and see what height best fits your screen. When looking at a preset "lrtemplate" file, you will see that some develop tools (sliders) are represented by multiple properties. Some are hard to understand. By default, these are hidden. Selecting this option will list them. BTW: these settings do not always have a good description. This option determines whether develop settings that still have their default value will be shown. When turning off, only settings that have been altered will be shown. If you want to see which settings will be applied, you should leave this option on! Advantage of the embedded files is stability and loading speed. Further you do not need a internet connection to show the page properly. This setting controls whether the plug-in automatically opens the report upon finishing in your browser, or not. Select the "View preset" option from "Preset Viewer"
This may take a little time the first time. 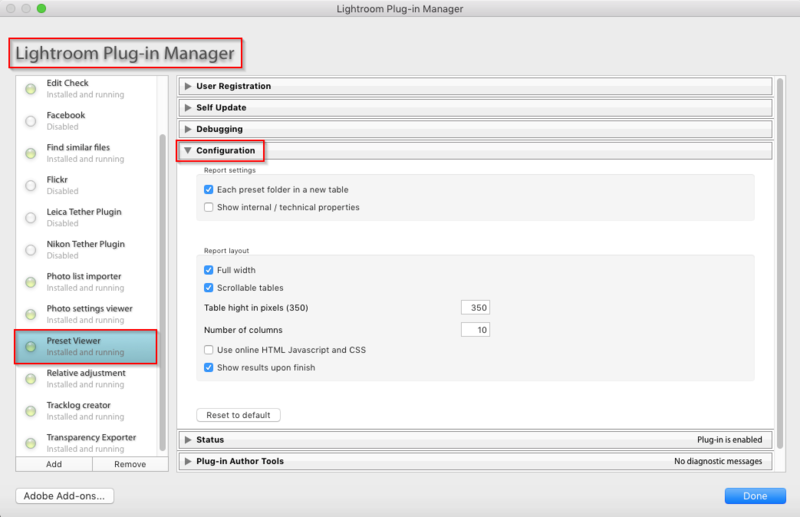 In the "Configuration" tab of the Plug-in manager you can set the default for the options of the plug-in. The options you find here are identical as of those described above in the Features / options paragraph. 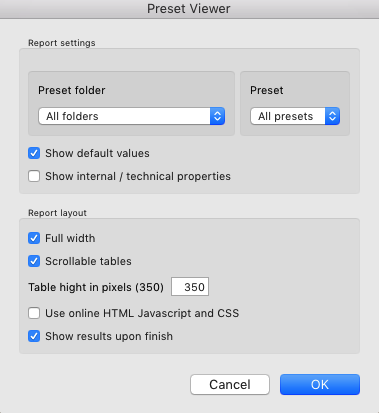 Extra is the "Each preset folder in a new table" option, see explanation below. If this option is checked, each preset folder will start in a new folder. Preset folder "Lightroom B&W filter presets" contains 8 presets and the"Lightroom B&W presets" contains 7 presets. Further if the option "number columns" is set to 10. This type of preset has a lot op settings and gives you a good starting place. This type of presets only handle / adjust a small aspect of the development, for example tone or vignetting. As the name suggest, it can be stacked on other presets. Remember the "Old age" preset we talked about in the start. This is typically a "Starting place" preset. I you apply this preset straight on a fresh, undeveloped image, you have a nice head start. However, if you apply it on a master photo you already developed it will conflict with and overwrite current settings. Matt Kloskowski's video "All about presets"
Good description of presets and explains the potential problem of conflicting and overriding settings.